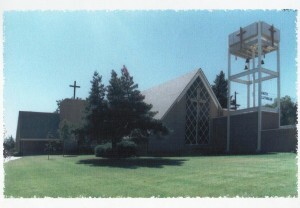 Faith Lutheran Church had its humble beginnings in meetings of the Board of Elder of Emmaus Lutheran Church in Denver, Colorado. The interest of Emmaus Lutheran Church in expanding God’s Kingdom led to a canvass of this neighborhood and a drive for funds in Emmaus Church. About $10,000 was raise by Emmaus Lutheran Church members for this project. Mr. Henry N. Johanns purchased the original property and put a great deal of time and effort into the newly forming congregation. Mr. Richard J. Fricke provided the house at 4760 Elm Court, whcih served as the first parsonage and Sunday School building. The first church building was erected with money and labor provided by the members of Emmaus Lutheran Church; however, due to war-time restrictions problems were ample. 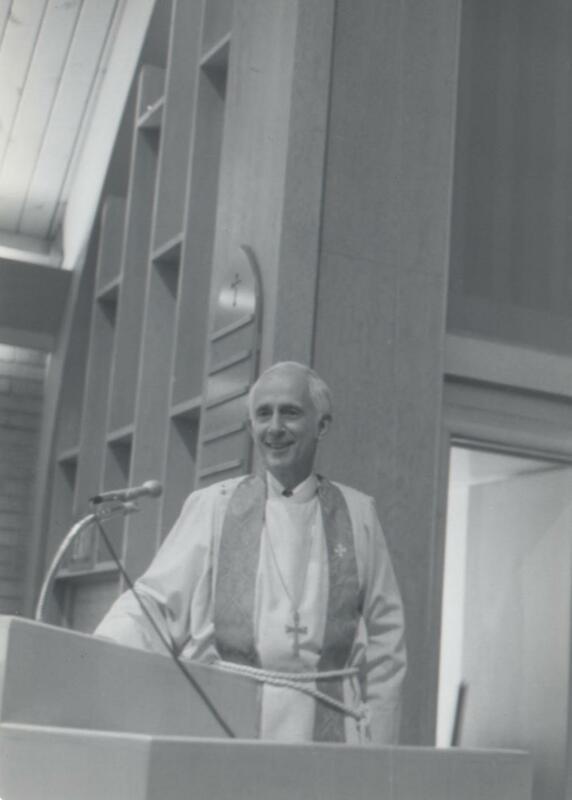 On August 20, 1944, the church was dedicated with the Rev. E.J. 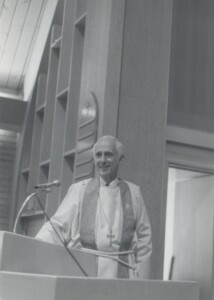 Friedrich, Superintendent of Lutheran Sanatorium, Wheatridge, Colorado as the speaker. This service was attended by 538 people, and an offering of $1500 was received that day which enabled Faith Lutheran Church to start their ministry debt free. About thirty people of Emmaus transferred to the newly organized congregation. Emmaus also gave the new daughter congregation $1000 and loaned an additional $1000 which was repaid. The first pastor of Faith Lutheran Church was the Rev. R.E. Schulz, who had been the Assistant Pastor at Emmaus Lutheran Church. When he accepted a Call to Salt Lake City in 1945, the Rev. Carl Mehl was called and installed. In 1952, Pastor Mehl accepted a position with our church’s radio station KFUO in St. Louis. In the same year that Rev. Carl Mehl left our congregation, we were blessed by God to have the Rev. Warren H. Willie called and installed. During Pastor Willie’s time, the congregation saw great growth in membership, and due to this fact, additional buildings were needed. 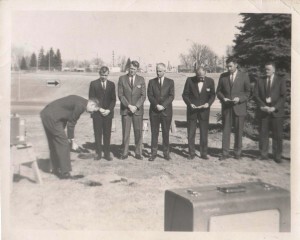 In 1950, the school wing consisting of two classrooms and library and basement was dedicated. In 1952, a parsonage on site was erected, and later burned to the ground. As time went on, the irrigation canal on the property was disbanded, and the land was deeded to the congregation by the United States government, since the canal had been previously designated as US property during the Civil War. With the deed now in place, the canal was tilled and covered. In 1956, the present church building which sits adjacent to the old building was dedicated. The current sanctuary will seat 430 people, and with slight modification can be enlarged to seat an additional 100. When the building was erected in 1956, the cost of construction was $103,000 without furnishings. The furnishings, including a 4 rank Wicks pipe organ cost the congregation $11,000. In 1976, the organ saw an additional rank of pipes added bringing the total ranks to five. Through all the years God has blessed our congregation richly through its many members, teachers in our day school, and Pastors that He has sent us. Lord willing, we will celebrate our 75th anniversary on August 4, 2019!